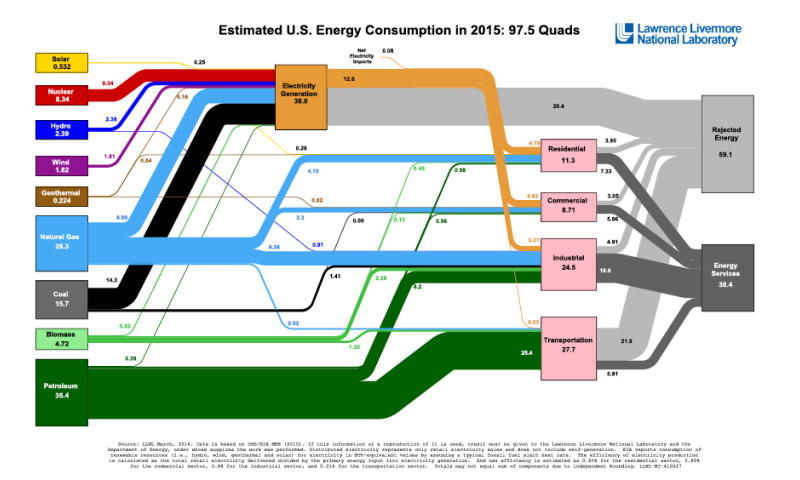 Americans used less energy overall in 2015 than the previous year, according to the most recent energy flow charts released by Lawrence Livermore National Laboratory. Each year, the Laboratory releases energy flow charts that illustrate the nation's consumption and use of energy. Overall, Americans used 0.8 quadrillion BTU, or quads, less in 2015 than in 2014. (A BTU or British Thermal Unit is a unit of measurement for energy; 3,400 BTU is equivalent to about 1 kilowatt-hour). Natural gas use increased by 3 percent to 28.3 quads while coal use decreased by 12 percent to 15.7 quads. "The drop in coal consumption is almost entirely due to the electricity sector, which continues to use more natural gas, in favor of coal," said A.J. Simon, group leader for LLNL's energy program. In fact, much of the overall decrease in energy consumption can be traced to the shift from coal to gas, because modern gas-fired plants may use up to 46 percent less energy to produce the same amount of electricity." Renewable energy continues to grow, with use of wind energy up 5 percent, geothermal energy up 11 percent, and residential solar energy up 11 percent. 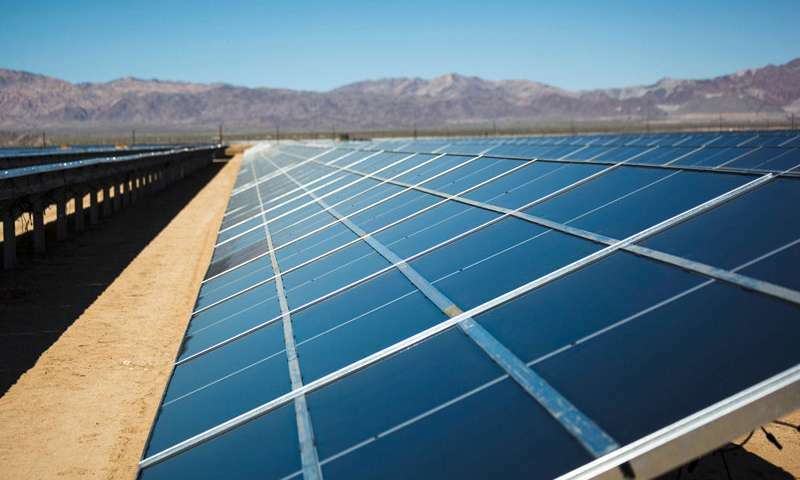 Utility scale solar energy, which saw the completion of several major projects in recent years, was up 25 percent. Prices for photovoltaic panels have fallen dramatically over the past decade, contributing to solar energy's rapid growth. Residential natural gas consumption fell by 0.5 quads in 2015 due to a mild winter. Commercial and industrial uses of energy saw much smaller decreases. Not all the energy consumed is put to use and accounts for the rejected energy, according to the charts. The country wasted 1 percent less energy in 2015 going from 59.4 quadrillion BTU in 2014 down to 59.1 quads in 2015. This decrease is tied to the increase in efficiency of the electricity production sector, such as large solar farms in the desert, according to Simon. The majority of energy use in 2015 was used for electricity generation (38 quads, down slightly from 2014), followed by transportation, industrial, residential and commercial. The residential, commercial and industrial sectors used less energy in 2015 except for petroleum use, which increased by 2 percent. Petroleum use continues to track with the nation's steady and modest economic growth - more people are driving for work and recreation, and more economic activity increases commercial and industrial shipments.